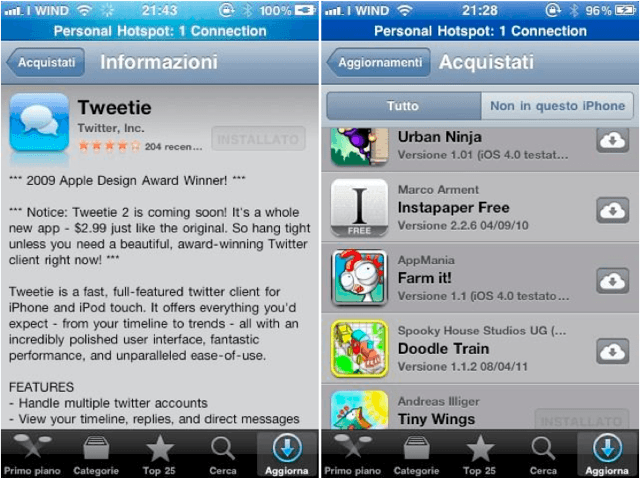 With the introduction of the App Store’s new ‘Purchased’ feature at WWDC yesterday, users can now download old iOS applications that may no longer be available for purchase, such as the original Tweetie application that is now Twitter. When you navigate to the Purchased section of the App Store on your iOS device – under the Updates tab – you can now browse through a list of every iOS application you’ve ever downloaded. As noted by MacStories, this gives you access to applications that may no longer be available, such as the original Tweetie app before it was later taken over by Twitter, and the Instapaper Free app that was recently removed by its developer in favour of the paid version. You can’t, however, download apps that Apple has removed from the App Store for breaching its rules. This little trick doesn’t seem to work for everyone unfortunately – I can’t download the Tweetie application, for instance. I’m guessing that’s because I updated the app when Twitter took over, rather than downloading Twitter as a new application. If you have any success, or you notice anything new, please let us know about it in the comments.